"My pitching style is very aggressive, often pitching to to contact and pounding down in the zone. I like to work fast, and I'm at my best when commanding my fastball and getting ahead of hitters." On his fastball: "I throw a four-seam and two-seam. The four-seam doesn't have as much movement but has more velocity (92-94-mph). I use it to pound the zone, challenge hitters and get ahead in the count. My two-seam is a sinker (90-92-mph) with true sink and induces a lot of ground balls and weak contact. The command of my fastball is what comes first with me. It's the most important. The command of location can enhance and make each pitch better." On his changeup: "I throw a modified circle-changeup. It has slight fade and depth away from left-handers and moves into right-handers. I use it to keep hitters off-balance and will throw when I'm ahead or behind in the count." On his slider: "It's probably my most inconsistent pitch but might be my best pitch when it's on, moving with good, late depth. My goal is to refine that pitch and make it look the same as a fastball right until the end." Fisher Cats manager Sal Fasano gave Hutchison three AA starts last season, and the 20-year-old responded with three wins, 15 innings, 10H, 2ER, 21K, 2W. "He's fun to watch work. Very good stuff and commands both sides of the plate," Fasano told me today. "The slider is above average and he's got a good changeup. He has deceptive delivery in the way he throws across his body. Fierce competitor." 1. 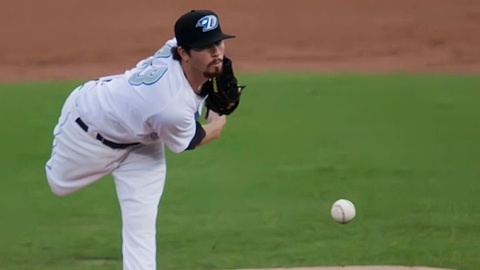 LHP Matt Moore, Rays -- Went berserk last season, racking up 79 strikeouts in 52.2 innings at Triple-A Durham. Made nine starts for the Bulls and went 4-0 (1.37 ERA). Next. 2. LHP Manny Banuelos, Yankees -- We've seen him pitch several times against the Fisher Cats. I know the little fella had control problems at AAA, but I'd still take him. 3. RHP Drew Hutchison, Blue Jays -- Excellent command. Plus-slider. See above. 4. RHP Chris Archer, Rays -- Electric upper-90s stuff but still a work in progress. Was the big arm in Matt Garza trade. 5. RHP Dellin Betances, Yankees -- A beastly specimen at 6-foot-8, 250 pounds, Betances gets on top of his pitches and throws 95-97-mph. He's like watching a huge Little Leaguer pitching from 46 feet. 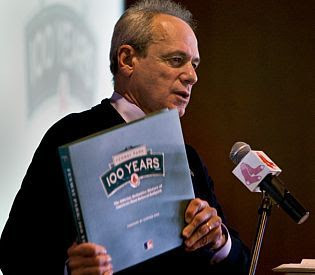 The Red Sox kicked off their 100th anniversary celebration of Fenway Park, starting with a theatrical performance of how the Boston plot of land was sold at auction 100 years ago. I must say, it was pretty cool, and I gave the Red Sox props in today's column, but I kept thinking about the Angels signing Albert Pujols. And while Mayor Tom Menino talked about train rides to Fenway Park as a kid, the Angels were picking up C.J. Wilson. While the Marlins delivered Mark Buehrle, and the Blue Jays traded for closer Sergio Santos, the Red Sox got former Blue Jays reliever Jesse Carlson and a coffee book. Nestor Molina is excited about the trade for Sergio Santos but is feeling the bittersweet emotions. "Really, I feel so happy because this can be my big opportunity, but I feel sad because I'm going to leave all my Toronto people," he said. "Were there times when Gose didn't run out a ground ball? I'm sure. Is it worth a headline in the Toronto Sun? Don't think so. We're talking about a dynamic player who stole 70 bases and sparked New Hampshire to an Eastern League title, played in the Arizona Fall League and kept right on going to winter ball. Personally, I would cut him a little slack if he didn't run out a grounder under the Peoria sunshine." Hate to break it to the folks at TMZ, but Ricky Romero and former Miss USA Rima Fakih are no longer an item. The power couple ended a serious relationship about a month ago. Good move for Ricky. The not-so-role-modeling Rima was busted for DUI on Saturday after driving a friend's Jaguar ... Caught up with Yankees prospect Joey Maher in Manchester, N.H. This kid is a character. Maher, 19, talks about adjusting to the pro game in this 90-second vid ... Here is video from a terrific baseball clinic held over the weekend. I was honored to be a coach at the event that raised $1,400 for three charities, including the Union Leader Santa Fund. ALEX ANTHOPOULOS: "I went to Winter Meetings, and all I got was this lousy T-shirt -- and a closer." (OK, you got me. The Toronto GM didn't really say that.) Today the Blue Jays re-acquired old friend Sergio Santos by trading top pitching prospect Nestor Molina in a straight-up deal with the White Sox. The Jays believe Santos -- a former New Hampshire Fisher Cats shortstop -- will continue to blossom into one of baseball's top closers. The deal comes with cost certainty, with Santos signed through 2014 and team options for the following three seasons. Sergio would stay on the books for no more than $31.5 million over six years as the Jays Prospects laid this out quite nicely. Question. Do you want to win games or save money? Toronto's biggest need is starting pitching, and Molina's stuff is so good that he would have filled that void. I envisioned him as Toronto's No. 2 or 3 starter by 2013, so it's tough to see him go. Had the Jays called him up next season, Molina would have been under control for six years at bargain-basement prices. For the record, I think this trade will come back to haunt the Jays. Funny we're even having this discussion because I remember Santos throwing a bullpen session for the Fisher Cats in 2007. He had 20 homers that year and won the Eastern League Home Run Derby ... Shout out to Drew Hutchison, who has just become Toronto's top pitching prospect. DID ALEX ANTHOPOULOS bring his A-game to Dallas? We shall see. The Blue Jays need pitching, and if the walls of the Hilton Anatole could talk, they'd share stories of Alex talking up prospects Nestor Molina, Travis d'Arnaud, Adeiny Hechavarria and others. The Toronto GM told reporters that Chad Jenkins and Deck McGuire (and others) are "on the cusp" of reaching the majors, which tells me he's looking to shop a package of youngsters for a proven big-league arm. The Cubs have been fielding questions on Matt Garza, who is among the best starting pitchers being shopped around at Winter Meetings. Memo to AA: dangle Adeiny and one of your stud catchers (Travis d'Arnaud, A.J. Jimenez, Carlos Perez) in exchange for Garza. I realize the Cubs have Starlin Castro at SS, but Theo can flip Adeiny elsewhere. In other news, Molina isn't fazed about recent discussions of him becoming a reliever. That's not the long-term plan, but I envision Molina earning a 2012 midseason callup, and then pitching from the bullpen to log some experience. In '13, he'll be in the starting rotation ... "I don't care if I'm a starter, reliever or closer. The most important thing is to be in the big leagues. That's my goal. I'm just looking for my opportunity, and I'm very sure I'm going to get that," Molina told me over the weekend. "I believe in myself. I've been working hard for three weeks (in Valencia, Venezuela) to get in good shape for spring training and to give a good surprise." Prince Fielder to Toronto? I don't see it. I think that's wishful thinking and speculation generated by Fielder and his agent, who are the Blue Jays are likely to increase spending by as much as $50 million in 2012. OH, RIMA. You wore the crown as Miss USA. You're our girl. Ricky's girl. Your hometown of Dearborn, Mich., boasts of your accomplishments. Needless to say, hire a driver next time. Rima Fakih was arrested on suspicion of drunk driving on Saturday, and then lied about it on Twitter. Michigan police officers pulled over the beauty queen at 3:30 a.m. for speeding, according to reports, and she was arrested on suspicion of DUI. I bet the mugshot is still gorgeous. UPDATE: Ms. Fakih took one for the team, appointing herself as designated driver because her friend was intoxicated, according to Rima's lawyer, Doraid Elder. He told MLive.com that Rima is "remorseful and apologetic to all those she let down." Rima Fakih is crowned 2010 Miss USA.